Monday June 16th 1890 We worked this forenoon and Winnie went to town besides I churned after dinner and intended to go to town but I was so hot and tired that I gave it up. Mary Woolf came in a little while and brought me some cherries Will went to town for meat in the evening. Tuesday June 17th 1890 I ironed in the forenoon and got the dinner. In the afternoon I wrote some and took the weeds out of Mothers flowers. I had Winnie pick gooseberries. Will and I went to town in the evening. Savage went home today. Wednesday June 18th 1890 Mr Pierce and his sister went home this morning. I was busy with the work having baking and other extra work to do till three oclock in the afternoon. I walked over town and came home with Mother who came in at noon on the Burlington road. Will finished putting in hungarian seed. Thursday June 19th 1890 There was a heavy storm last night that kept us awake so much that we slept late this morning. There was water to get out of the cellar and churning to do. Will Woolf brought a bushel of cherries and we seeded all them and put them up. weather very warm indeed. Friday June 20th 1890 There was another terrific storm last night with a heavy rain. We put up another bushel of cherries today in the afternoon. Laurence helped we put out a large washing. It was a very warm day. 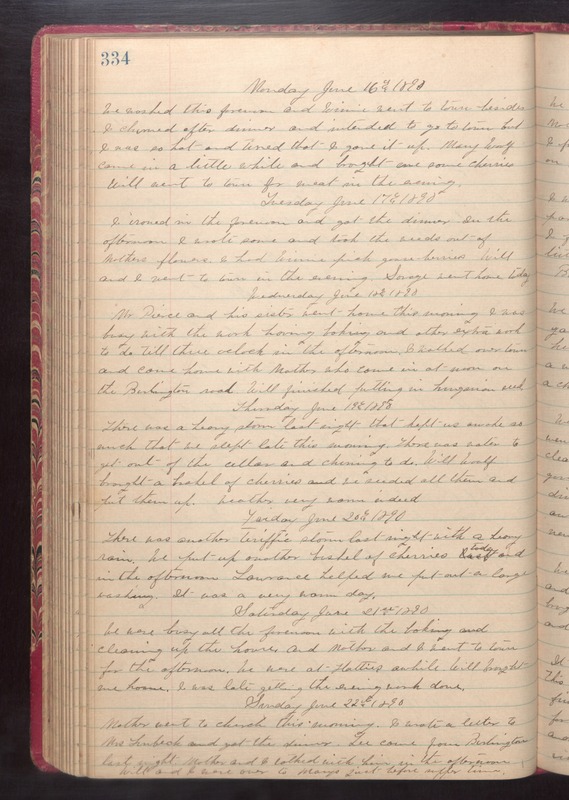 Saturday June 12st 1890 We were busy all the forenoon with the baking and cleaning up the house and Mother and I went to town for the afternoon. We were at Hatties awhile. Will brought me home. I was late getting the evening work done. Sunday June 22nd 1890 Mother went to church this morning. I wrote a letter to Mrs Lumbeck and got the dinner. Lee came from Burlington last night. Mother and I talked with him in the afternoon. Will and I were over to Marys just before supper time.